Rubella, also known as the German measles, is an infection in which there is a rash on the skin. Congenital rubella is when a pregnant woman with rubella passes it to the baby that is still in her womb. Rubella is caused by a virus that is spread through the air or by close contact. A person with rubella may spread the disease to others from 1 week before the rash begins, until 1 to 2 weeks after the rash disappears. Because the measles-mumps-rubella (MMR) vaccine is given to most children, rubella is much less common now. Almost everyone who receives the vaccine has immunity to rubella. 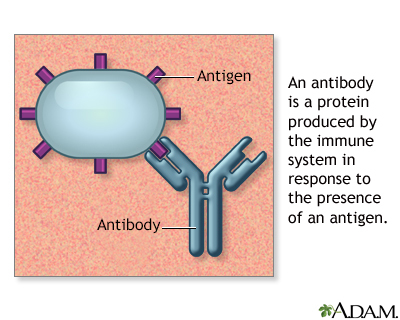 Immunity means that your body has built a defense to the rubella virus. In some adults, the vaccine may wear off. This means they are not fully protected. Women who may become pregnant and other adults may receive a booster shot. Children and adults who were never vaccinated against rubella may still get this infection. Children generally have few symptoms. Adults may have a fever, headache, general discomfort (malaise), and a runny nose before the rash appears. They may not notice the symptoms. A nasal or throat swab may be sent for culture. A blood test can be done to see if a person is protected against rubella. All women who may become pregnant should have this test. If the test is negative, they will receive the vaccine. There is no treatment for this disease. Taking acetaminophen can help reduce fever. 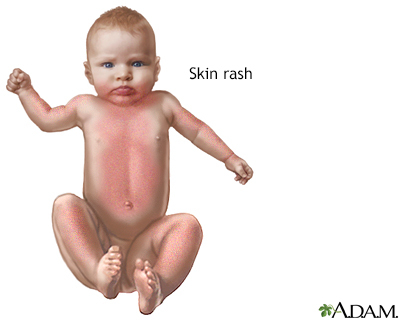 Defects that occur with congenital rubella syndrome can be treated. Rubella is most often a mild infection. After an infection, people have immunity to the disease for the rest of their lives. Complications can occur in the unborn baby if the mother becomes infected during pregnancy. A miscarriage or stillbirth may occur. The child may be born with birth defects. There is a safe and effective vaccine to prevent rubella. The rubella vaccine is recommended for all children. It is routinely given when children are 12 to 15 months old, but is sometimes given earlier during epidemics. A second vaccination (booster) is routinely given to children ages 4 to 6. MMR is a combination vaccine that protects against measles, mumps, and rubella. Women of childbearing age most often have a blood test to see if they have immunity to rubella. If they are not immune, women should avoid getting pregnant for 28 days after receiving the vaccine. Anyone whose immune system is affected by cancer, corticosteroid medicines, or radiation treatment. Great care is taken not to give the vaccine to a woman who is already pregnant. However, in the rare instances when pregnant women have been vaccinated, no problems have been detected in the infants. Mason WH. Rubella. In: Kliegman RM, Stanton BF, St. Geme JW, Schor NF, eds. Nelson Textbook of Pediatrics. 20th ed. Philadelphia, PA: Elsevier; 2016:chap 274. Robinson CL, Romero JR, Kempe A, Pellegrini C; Advisory Committee on Immunization Practices (ACIP) Child/Adolescent Immunization Work Group. Advisory Committee on Immunization Practices recommended immunization schedule for children and adolescents aged 18 years or younger - United States, 2017. MMWR Morb Mortal Wkly Rep. 2017;66(5):134-135. PMID: 28182607 www.ncbi.nlm.nih.gov/pubmed/28182607. Rubella is a contagious viral infection with mild symptoms associated with a rash, fever, headache and runny nose. It can be transmitted to a fetus by a mother with an active infection. 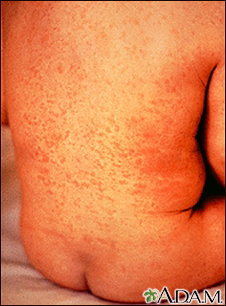 Another name for rubella is German measles.